After the AP Exam I like to host an AP Awards Day to bring attention to the special moments and qualities that our group of students had. I make a slideshow of pictures from projects and students in class throughout the school year. The students vote on the superlatives before the awards day and I hand out the certificates to the students. 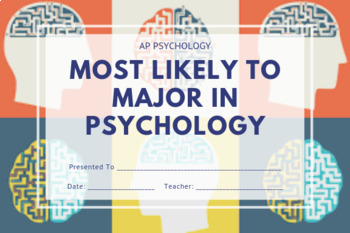 The most prestigious award is the "Most Likely to Major in Psychology" certificate. There are about 15 award ideas on the ballot. 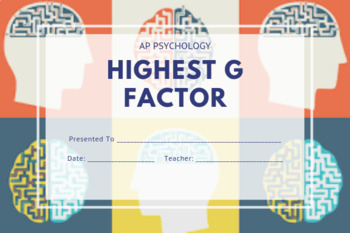 All of the superlatives are exclusive to psychology and some are for the "inside jokes" of the class. You are purchasing the voting sheet for the students and the certificates I made for the superlatives. I recommend printing in color!